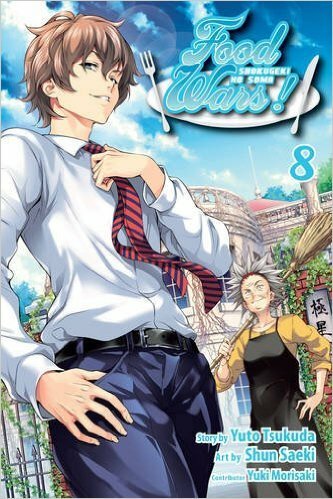 Food Wars Volume 8 picks up right where the battle for the Fall Classic preliminaries left off in Volume 7. The results are in and as expected, Soma takes a top spot in his battle against the curry master, Akira Hayama. After an intense battle to win the judges’ taste buds, both contestants move on to the next round of the Fall Classic. To keep Soma and Megumi occupied until the next task is announced, members of Polaris band together to celebrate, cook, and experiment. Isshiki makes one of his rare appearances as a fully clothed human and takes Megumi and Soma off to a children’s cooking class. He abandons them to the rowdy, difficult children and goes about his own business. After a while Soma and Megumi find ways to lure the children into the art of cooking and some very hunger inducing scenes follow. Afterwards the Polaris trio return to campus and the waiting game begins. Instead of mailing letters to the lucky few who survived the Fall Classic prelims, the school decides to summon each student one by one to inform them of their first challenge in person. Clearly this information is too precious to be shared by snail mail. Soma finds out that he is the first up and he has to face… Alice Nakiri! Everyone except Soma loses their cool – it’s as if fate has already been decided for him! He is totally going to lose against a Nakiri. Of course, fate is really on Soma’s side because the theme is… bento! That’s right! I was shocked when I read this. A bento seems so ordinary for a luxury cooking institute; however, a bento is still a meal that could be had in a restaurant and therefore it is an area that students must explore. Can Soma awe his pessimistic peers and defeat a Nakiri in front of the entire school? Well you’ll actually have to wait until Volume 9 of Food Wars because this one leaves off on a cliff-hanger just like the last volume. Instead of a conclusion, we get a short story about Erina Nakiri’s summer vacation. I really enjoyed this volume despite being left in suspense. I thought the idea of bringing a bento into the challenge was fantastic because it channels what Soma is best at – traditional Japanese family cooking. I was reminded of the donburi challenge. If you recall, everyone was convinced Soma would lose and get expelled; however, he stuck with the basics of Japanese cooking and stayed away from anything flashy. He understood the true essence of a rice bowl dish, unlike his opponent who relied upon expensive meat and fancy presentation. I predict that Alice Nakiri will also fall because she has relied too heavily upon her expertise as a chemist instead of looking at the basics of traditional Japanese cooking. Like the “Meat Master,” I expect Alice to lose based upon the use of flashy equipment and gaudy presentation. You won’t find those things in a real bento and I think Soma has this one nailed. He’ll beat Alice and move on to the next round of the Fall Classic. I’ll have to just wait until the next volume to find out if my prediction is true.